“Come . . . all who are . . . burdened. . . . my burden is light.” This is a very different kind of unburdening than we’d initially think and, on brief reflection, different than we might even want. The idea of being unburdened conjures up images of running a full-tilt Olympic sprint without restraints, completely unencumbered. We certainly have this in store for us in heaven, but this isn’t going to be our experience now. Instead, what we’re offered here is the freedom to no longer have to pull the entire load ourselves. 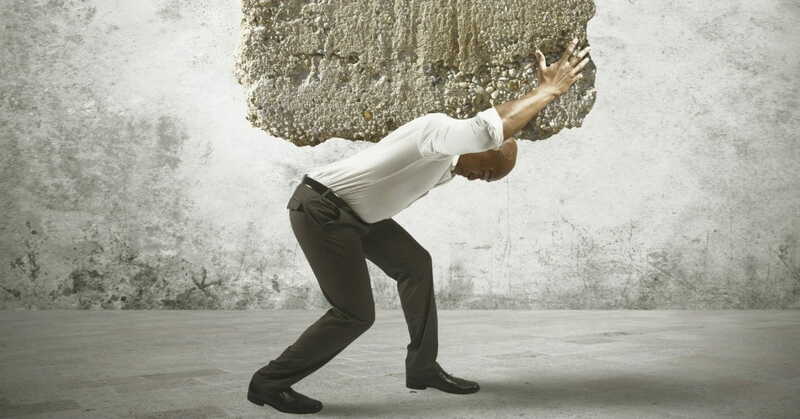 What’s the heavy burden we’ve been pulling? The yoke Jesus speaks of is that old-fashioned farming tool used to leverage the strength of oxen to till the farmer’s land. In the metaphor, Christ offers us to join his yoke, meaning he not only offers to be our “yoke fellow” (a constant companion for the journey) but also to bear the brunt of the load for us as the stronger ox. Trying to pull in a different direction than he’s going will result in chaffing and pulled muscles—not from doing the work but from the yoke itself. In this sense, true freedom comes from a different place than we’d expect. Our natural mind thinks freedom comes from one of two endpoints: either the complete indulgence of our sin or else the complete unrestraint from any sin struggle at all. Instead, Jesus says true freedom comes from the “light and easy” work of being in the harness alongside him. Note the implications for how we treat ourselves here as well. If we’re going to be harnessed with Christ, we need this same gentleness and humility with ourselves, especially when we feel the burden getting heavier again from not following his lead. While this has application for every believer, would this somehow apply any less to the Christian leader? Of course not. However, except for unique situations, this likely can’t be played out publicly in real time in front of our congregation or the ministry participants we lead. As Christian leaders, we need support from those who understand our unique situation and are willing to extend grace as we imperfectly work through things. Practically speaking, each of us needs at least one person we can reach out for such support. This is a safe person who can be cultivated for such a purpose. If we don’t have one, we may need to pay for one. Professionals like me exist for a reason. It can be expensive, but lack of support in a critical time can be even more expensive, costing significantly more than just dollars. Think about it: What’s the price of a lost marriage partner, visitation to kids on the other side of the country or the complete loss of decades of ministry investment? Michael Todd Wilson is a licensed professional counselor and board-certified coach with Intentional Hearts, offering specialized coaching to Christian men in the recovery and pursuit of sexual integrity. He is also director of ShepherdCare, equipping Christian leaders for health and long-term effectiveness in ministry. He is the author of Unburdened, coauthor of Soul Virgins: Redefining Single Sexuality (Sexual Wholeness Resources) and Preventing Ministry Failure.